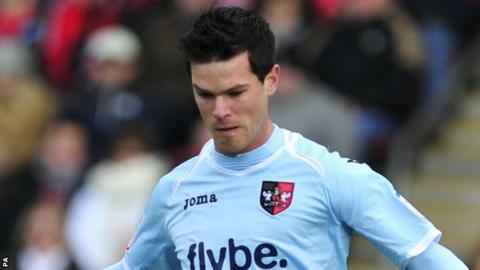 Exeter City substitute Jimmy Keohane came off the bench to beat struggling Accrington with two late goals. The game's first effort of note came midway through the second half when the Grecians' Guillem Bauza almost got in. Bauza's replacement Keohane then broke the deadlock when he fired home from the edge of the area on 79 minutes. Then, just three minutes later, after Exeter's Danny Coles had hit his own bar, Jamie Cureton set up Keohane to tap in his victory-sealing second. Exeter's win at St James Park moves them into the automatic promotion places, ahead of Saturday's fixtures. Accrington, who stretched their winless run to six, are still without a victory away from the Store First Stadium since November. "It was nice to have Jimmy Keohane come on with 25 minutes to go with that energy. He's improving all the time, and he's getting better with the tough parts of the game as well. "It was a performance that wasn't perfect, but was solid enough and it had enough quality in it to make the difference, . "Both the goals were creative, with assists from Tommy Doherty for the first, then Jamie Cureton for the second." "The spectacle for the neutral wouldn't have been pleasant. The two teams set up very identical and were trying to do the same thing. "The two goals are not good to watch. They're very poor from our point of view and that's the message to the lads. "We worked a lot this week on being solid. We were aware that Exeter struggle to break down teams at home. If you stay in the game and don't make mistakes, you get a result."